KIEV, March 16. /TASS/. Ukrainian subsidiary of Sberbank has temporarily blocked spending operations on credit cards for individuals, according to Sberbank press release. "We inform you about temporary blocking spending operations on credit cards for individuals. Repayment of debt done in the standard mode," the report said. On March 15, Ukrainian subsidiary of Sberbank introduced restrictions on cash withdrawals for legal entities, and also expanded previously imposed limits on banking operations for individuals. In addition, since March 16, withdrawals of bank metals and cash, both in national and foreign currency was limited to up to the amount of 30,000 hryvnia ($1,112) for individuals. At the same time, a limit of 30,000 hryvnia ($1,112) was set for non-cash operations from current accounts. Restrictions also affect operations with bank cards - volume of noncash settlements cannot exceed 30,000 hryvnia ($1,112) per day. In case of cash withdrawal, the limit is 20,000 hryvnia ($741), the limit on money transfers from card to card cannot exceed 30,000 hryvnia ($1,112). Earlier on Thursday, Ukrainian President Pyotr Poroshenko imposed sanctions against five banks with Russian state capital operating in the Ukrainian market. Sanctions were introduced after the decision of the National Security and Defense Council of Ukraine adopted the day before. Restrictions are introduced for a year against Sberbank, VS Bank, Prominvestbank, VTB Bank and BM Bank. Sanctions include a ban on withdrawal of funds outside of Ukraine, as well as payment of dividends, interest, return of interbank deposits and loans, funds from correspondent accounts of subordinated debt. The ban also concerns distribution of profits and capital of these five banks. At the same time, restrictions, according to the National Bank of Ukraine, do not prohibit settlements between residents of Ukraine and their counterparties who have accounts in the parent structures. Earlier Head of the Council Alexander Turchinov said that the National Security and Defense Council of Ukraine instructed the National Bank and the Security Service of the country to make proposals within a day for imposing sanctions against banks with a state share of the Russian Federation. Since March 13, Ukrainian nationalists have been blocking activities of Sberbank’s central office in Kiev, pitched tents in front of the building, made bonfires. 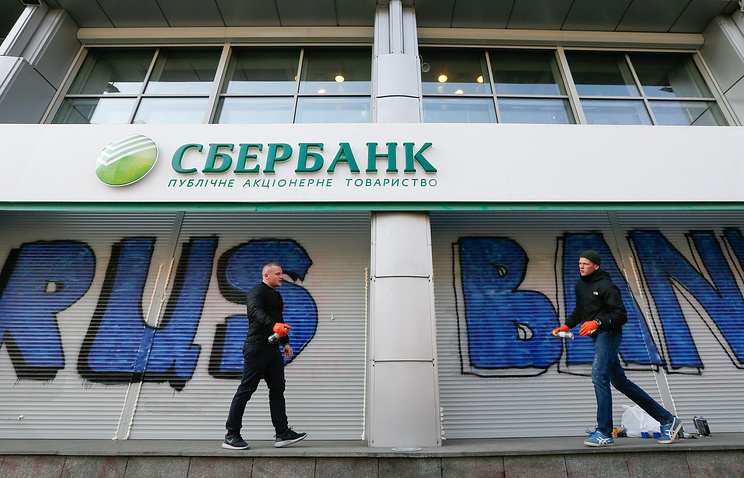 At the same time, Russian banks in Ukraine are under pressure from the authorities. The National Bank of Ukraine announced on March 7 that it is ready to initiate sanctions against Sberbank’s subsidiary in Ukraine, if information about the bank providing services in Russia to customers with passports of Donetsk and Luhansk People's Republics is confirmed. Ukrainian unit PJSC Sberbank was founded in 2001, with Sberbank as the sole owner. 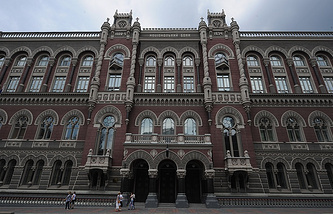 According to the National Bank of Ukraine, as of July 1, 2016, Sberbank held the 7th place (47.845 bln hryvnia - $805.15 mln) among the country’s 108 banks in terms of total assets. Ukrainian President Pyotr Poroshenko has approved sanctions against Ukrainian branches of five Russian banks, his press service reported on Thursday. The one-year sanctions were imposed against Sberbank, VS Bank, Prominvestbank, VTB Bank and BM Bank. The president ordered the Ukrainian Foreign Ministry to inform the EU, US and other countries about the sanctions and ask them to impose similar restrictive measures against these banks.